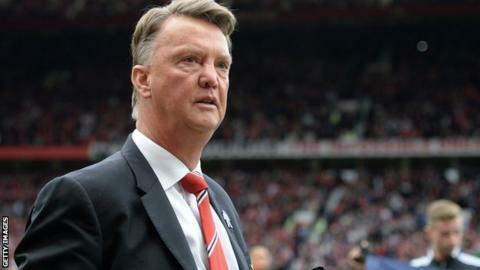 Man Utd: Are the Premier League leaders genuine title contenders? Manchester United are back on top of the Premier League for the first time in 770 days as the landscape suddenly shifts and Manchester City go from looking invincible to vulnerable. United's 3-0 win over Sunderland saw them overhaul neighbours City - who lost 4-1 at Tottenham - to occupy a position they have not held since the first match of David Moyes' abysmal reign as manager, when they won 4-1 at Swansea on 17 August 2013. And while this was a symbolic result rather than a statement of title intent, there were events elsewhere that made it a day of Premier League significance. Are Man Utd genuine title contenders? Manager Louis van Gaal can study the table with quiet satisfaction - but he will know this is merely an opening salvo and much work needs to be done. Even so, with City losing and Chelsea's defensive frailties without captain John Terry exposed as they were held to a draw at struggling Newcastle, Van Gaal might be tempted to burst into song once more at Saturday's developments. Chelsea manager Jose Mourinho - who has never won a league game on Tyneside - was ultimately grateful for a point after his side came from two goals down late on to earn a draw. It was, however, an unconvincing performance from the reigning champions, who are 15th, and one that suggested plenty of problems still need to be solved before they return to the authority of last season. United's title credentials may become a lot clearer after their next three games, which take them to Arsenal, followed by a trip to Everton that often ends in disappointment then the Manchester derby at Old Trafford on Sunday, 25 October. What is certain is that the cards have fallen in United's favour in recent weeks and suddenly the future looks a lot brighter. The failure of goalkeeper David de Gea's proposed move to Real Madrid followed by the 24-year-old's decision to sign a new four-year deal not only ended uncertainty and lifted the mood around Old Trafford, it meant United could restore a goalkeeper who is deservedly ranked among the best in the world as their last line of defence. De Gea's mere presence increases United's chances of success - while the £36m move for 19-year-old Monaco striker Antony Martial on transfer deadline day is starting to look like a masterstroke. The world's most expensive teenager has not only scored three goals in three Premier League games, he has demonstrated a natural eye for a finish and the sort of raw pace that will unsettle any defence. Martial's impact looks certain to provide more space and opportunities for Wayne Rooney as an attacking foil - while Van Gaal will also be pleased Memphis Depay got on the scoresheet against Sunderland. So it is too early to say if United can challenge for the title - and realistically the odds are still against with visits to all their serious rivals to come - but there has never been any bad news in being top of the table. Can Man City cope without Kompany? Manchester City had every right to complain about officials in their loss at Tottenham, especially when Kyle Walker was yards offside right in front of referee's assistant Simon Beck as Eric Dier equalised seconds before half-time. There was also an offside before Harry Kane scored Spurs' third goal, while visiting manager Manuel Pellegrini could point to a conspiracy of events with goalkeeper Joe Hart and David Silva out through injury and Yaya Toure injured with Spurs leading 2-1. What is of greater concern is the manner of City's capitulation - and also the further evidence that they struggle without the power, leadership and influence of captain Vincent Kompany, who was absent at White Hart Lane because of illness. Pellegrini may have spent more than £60m on central defenders Eliaquim Mangala and Nicolas Otamendi but still no-one comes near to filling the gap left by the 29-year-old Belgian when he is unavailable. He suffered a calf injury before Juventus scored their winner in the Champions League group game at Etihad Stadium and was still missing when they conceded their first goals of the season in their first defeat at home to West Ham. Since Kompany went off against Juve, his side have conceded eight goals in 285 minutes - one every 35.6 minutes - while beforehand they had conceded none in 450 minutes. The stats suddenly make uncomfortable reading for a team that threatened to make the title race a stroll in those opening weeks, with two losses following 11 successive league wins. It is only the second time they have lost successive league games under Pellegrini, while they have conceded more goals in their last two (six) than in their previous 11 combined (four). It was also the first time they have conceded three goals in a single half since 2013 and was their heaviest loss since a 3-0 defeat at Liverpool in April 2011. Liverpool manager Brendan Rodgers has come under increasing pressure and scrutiny as a poor start to the season followed a dismal end to last term that required a review from owners Fenway Sports Group before he was given backing to continue. Two wins from their first six Premier League games and a scraped victory on penalties over League Two Carlisle at Anfield in the League Cup did nothing to ease the sense that Rodgers is only ever one defeat away from a major crisis - especially with two managers of the calibre of Jurgen Klopp and Carlo Ancelotti available and heavily linked with the club. Rodgers faced a defining 10 days before Saturday's meeting with Aston Villa at Anfield, which is followed by a Europa League game against Swiss side Sion and the Merseyside derby at Everton. So it will have come as a huge relief to Rodgers for Liverpool to beat Villa 3-2 - although the manager took the opportunity afterwards to claim there is a mysterious group of people who do not want him at the club. And in Rodgers' most desperate hour of need, he was helped by the return to the goal standard of England striker Daniel Sturridge, making only his second league start of the season after months on the sidelines with injury. Sturridge has helped provide respite for Rodgers, even if it may yet prove temporary, but there is every reason for Liverpool to celebrate the return of the 26-year-old who scored 24 goals in 2013-14. "Sturridge showed what we missed for over a year - he makes the difference and helps you compete," said Rodgers. "His finishes were brilliant. He's nowhere near 100% fit yet but his two goals were the difference." Liverpool's manager has had enough criticism in recent times - so he has every right to enjoy a day when his side returned to winning ways. Goal drought, what goal drought? Some of the Premier League's main marksmen had been suffering a goal drought before Saturday - but the good news for Spurs, Arsenal and Manchester United is that they look to be back in business. Harry Kane, who scored 21 goals in 34 league games last season, had gone more than 12 hours without a goal before he reacted instinctively after a free-kick hit the bar to score Spurs' third in their outstanding win against Manchester City. The barren run of 748 minutes was over. "There has been a lot of talk but I'm a confident man and have faith in my ability," said Kane. "I'm delighted because this was a very good victory against a team who were top of the table." Wayne Rooney was in the worst run of Premier League scoring form since starting his career as a 16-year-old with Everton in August 2002 - but a scoreless run stretching to exactly 1,000 minutes ended when he scored Manchester United's second against Sunderland. It made the stats much more palatable reading, as he became United's joint-third leading league scorer, level with Denis Law on 171. Only Sir Bobby Charlton (199) and Jack Rowley (182) have more. Arsenal's Alexis Sanchez sparked into life in even more spectacular fashion, hitting a treble for his first league goals of the season in the 5-2 win at Leicester City. The Chilean was in magnificent form as he became the first player to score hat-tricks in the Premier League, Serie A and La Liga. "It took Alexis a while to find his form," said Arsenal manager Arsene Wenger. "He didn't come back straight away from the Copa America and after a competition like that it takes some time. Alexis was waiting for a goal - he's not used to not scoring so it was important for him to score." And just to add to Wenger's delight, Theo Walcott has slipped under the radar as he builds a reputation as a regular goalscorer. Used more often as a central striker these days, his goal at Leicester was his 12th in his past 13 league games.